Posted on August 16, 2016. Subscribe to our blog by email. Welcome to the August 2016 issue of the Global Washington newsletter. Sustainable Development Goal 4 (SDG4) is to “ensure inclusive and equitable quality education and promote lifelong learning opportunities for all.” The stakes are high for this target, in part because reaching all of the 17 SDGs largely depends upon the success of this one goal. And achieving this goal means educating women and girls at unprecedented levels. We know that education empowers individuals, and in turn has a transformational impact on their families, communities and our world. This month’s issue campaign takes a closer look at global education and the prominent role it plays in all other areas of global development. We’ve highlighted a number of Global Washington members who are making strides with their current education programs, and featured two in particular with unique models and inspiring roots. As students throughout Washington state and around the U.S. get first-day jitters, and as parents hustle to get school supplies and schedules organized, I urge you to take a moment and think about students in developing countries gaining access to life-changing education for the first time. And I challenge you to think about your role in ensuring that we reach SDG4. Like so many of the issues Global Washington members tackle, this will only be conquered with a combined effort of NGOs, businesses, foundations, academic intuitions, and plenty of smart and dedicated people. Also, this is the last week to take advantage of the early bird rate for our “Allies for Action” conference on December 8, 2016. If you haven’t yet registered, do so today. Enjoy these last few weeks of summer and I look forward to seeing you in the fall. Is your organization planning a social media campaign this fall? If so, please provide us with the details. Educating people is vital to global development efforts. While there have been tremendous strides in improving access and quality of education throughout the world, 124 million children are still out of school and 757 million adults, two-thirds of whom are women, cannot read or write. The success of Millennium Development Goal 2 (MDG2), which aimed to accelerate progress in achieving universal primary education by 2015, has brought primary school enrollment up from 52 percent in 1990 to almost 91 percent in 2015. However, large disparity remains among poor and rural households and conflict-ridden areas. With increasing evidence that education can drastically improve people’s lives, Sustainable Development Goal 4 (SDG4) expands on MDG2 by promoting free primary and secondary education for all and working to eliminate gender and income inequality in education. SDG4 has ten targets, which in addition to promoting free education and equality, also focus on education quality, teacher quality and student performance. If all students in low-income countries were to develop basic reading skills, 171 million people could be lifted out of poverty. Success in education efforts can lead to achievements in issues addressed by other SDGs. For example, students who complete primary school are less than half as likely to contract HIV when compared to students who do not complete this level of education. 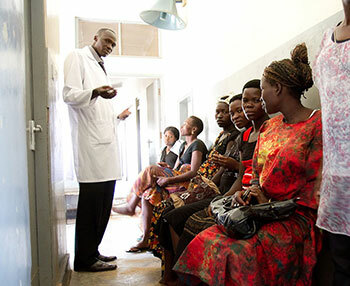 And educating women can have enormous effects on family health, such as decreased stunting and nutritional disorders in children, as well as lower rates of child mortality. In fact, if all women in low and middle-income countries completed secondary school, the under-five mortality rate would fall by 49 percent. Women with six or more years of schooling are more likely to seek prenatal care, skilled birth attendants and postnatal care. They are also 60 percent more likely to immunize their children. On average, increasing educational attainment of a country by just one year leads to growth in Gross Domestic Product (GDP) per capita of 2 to 2.5 percent. On the individual level, each additional year of education a child receives increases, on average, his or her income as an adult by 10 percent. And no country has ever achieved continuous economic growth without a minimum national literacy rate of 40 percent. Currently in sub-Saharan Africa and South and West Asia, 2.9 million girls are married by the age of 15. If all girls received secondary education, it is estimated that child marriage would fall by 64 percent and early births (before the age of 17) would fall by 59 percent. And it should be noted that risk of war and conflict is highest in areas where educational enrollment of males is low and youth population is high. The United Nations Educational, Scientific and Cultural Organization (UNESCO) created Education for Sustainable Development (ESD) to help countries incorporate issues such as climate change, biodiversity in agriculture, disaster risk reduction and clean water and improved sanitation into their educational curriculums. The goal of ESD is to develop global citizens who are ready to confront the challenges facing our world. With universal education playing such a vital role in achieving all of the SDGs, investment in education is crucial. At present, according to UNESCO, there is an annual financing gap of $39 billion that is needed to achieve SDG4. In order to meet SDG4 targets by 2030, spending per student in low-income countries will need to increase from $70 to $197, government spending will need to increase by 50 percent as a share of GDP, and international aid will need to increase six times the current amount. In addition to the financial challenges of achieving SDG4, other barriers include: lack of classroom space, war and conflict, gender discrimination, child labor, shortage of trained teachers, scarcity of learning materials, outdated curriculums and ineffective methods for measuring student performance. With all of these challenges, it is important for organizations to constantly evaluate and improve their strategies, and work together in smart and efficient ways to make achieving SDG4 a reality. Several Global Washington members are on the front lines of the fight for universal education. Ashesi is a private, non-profit liberal arts university located in Ghana, West Africa. The mission of the university is to educate a new generation of ethical and entrepreneurial leaders in Africa while cultivating within its students the critical thinking skills, concern for others and courage it will take to transform their continent. Founded in 2002 by Ghanaian Patrick Awauh, Ashesi offers four-year bachelors program grounded in a liberal arts core curriculum, featuring majors in Computer Science, Business Administration, Management Information Systems, and Mechanical, Computer and Electronic & Electrical Engineering. With an academic program designed in collaboration with some of the world’s best universities, and in partnership with local and multinational employers across Ghana, Ashesi has pioneered an educational experience like no other in Africa. Ashesi plans to broaden its impact by growing to 1,000 students by 2020 and adding new programs, while maintaining their strong culture of ethics and critical thinking. Ashesi is seeking partners to continue to expand their impact in Africa. Founded in 2004, the Bo M. Karlsson Foundation (BMKF) awards higher education scholarships to underprivileged women in Nepal, empowering them to become confident, self-reliant, vital citizens in their communities and country. 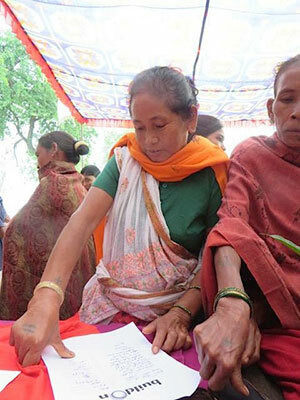 Over the past decade, BMKF has awarded scholarships to 45 young women who have gone on to pursue careers in accounting, business management, engineering, journalism, law, medicine, nursing, public health, rural development, social work and teaching — futures that were hopelessly out of reach before receiving scholarships to pursue their undergraduate degrees. As the majority of BMKF scholars come from remote villages, most of them are the first in their families to receive any education. Several scholars have a physical disability, belong to marginalized castes or ethnic groups, or have experienced harrowing civil war and human trafficking situations. All share a passion for education. BMKF is committed to helping them succeed. Lift Up Africa (LUA) has over 17 projects that provide for education in East and Southern Africa. LUA supports grassroots schools and community organizations in order to boost the good work that local people have initiated within their communities. Girls who escape early forced marriage, children with disabilities, orphans and children in poverty are some of the most vulnerable groups LUA projects help through education and other services. LUA takes a holistic approach to the education of these children which is why, whenever possible, projects incorporate feeding programs, medical services and counseling. Mission Africa believes that education is the key to ending generational poverty and that investment in education can have a profound impact on communities. Many African countries do not offer free education and Mission Africa is dedicated to ensuring that all children regardless of their income level have access to quality education. In the past ten years, Mission Africa’s academic scholarship program has awarded 795 scholarships and has allowed more than 300 students in rural villages in Nigeria, Tanzania, Kenya, Sierra Leone, Togo, Rwanda and Uganda to graduate high school and continue on to college or vocational training. Mission Africa has also shipped 10 40-foot containers filled with books and school supplies to children and families in Nigeria, Kenya and Tanzania. 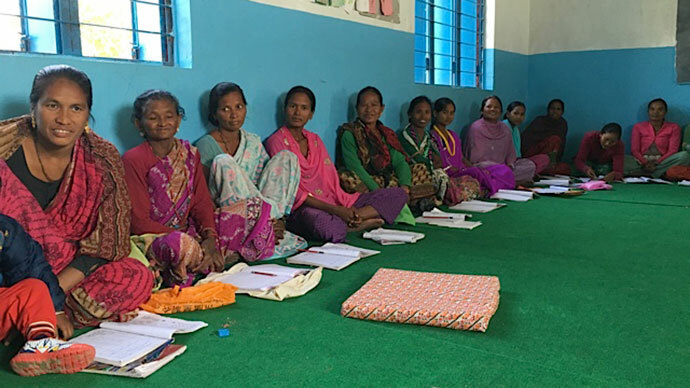 Since its founding in 1999, Mona Foundation has had a simple but compelling goal — to support grassroots education initiatives that build stronger and sustainable communities by raising the status of women and girls. Mona achieves this by partnering with local leaders and investing in the education of children and youth. Mona selects initiatives that are initiated and implemented by the local community and have a proven record of success. A long-term partnership strengthens the organizational capacity of each partner, which often leads to an increase in reach, greater efficacy of programs, and an expanded ability to address complex problems. Mona partners with organizations that work to reduce the barriers to education, improve quality of learning and cultivate agency among girls and boys. Programs use an integrated approach to develop academic skills, character and engaged citizenship. As a result, young people gain competency, agency, integrity and a commitment to building socially just communities. Mona Foundation has awarded more than $8 million to 35 initiatives in 18 countries. In 2016, Mona is supporting 18 initiatives in Panama, Brazil, Haiti, India, China, Vietnam, Mongolia, Haiti and the U.S.
NPH USA supports Nuestros Pequeños Hermanos (Spanish for “Our Little Brothers and Sisters”) which is raising more than 3,400 orphaned, abandoned and disadvantaged boys and girls in Bolivia, the Dominican Republic, El Salvador, Guatemala, Haiti, Honduras, Mexico, Nicaragua and Peru. NPH believes that a quality education is the key to a better life. Many children arrive at NPH with little or no formal schooling. Each child is given a strong foundation of basic academic and interpersonal skills and provided with an extensive variety of educational opportunities. Nearly all of NPH homes feature on-site schools from Montessori preschool through middle or high school, as well as vocational trade certification courses. In 2015, NPH supported 369 students in university – the most in the organization’s history. Children grow up to become accountants, carpenters, doctors, farmers, mechanic, nurses, teachers and community leaders. An additional 2,100 children who live in low income areas outside the homes receive scholarships to attend NPH schools. Click here to see stories of nine children who are learning in different ways at NPH. Rwanda Girls Initiative’s mission is to educate and empower girls in Rwanda to reach their highest potential. The organization’s vision is for students to graduate as inspired young leaders, filled with confidence, a love of learning and a sense of economic empowerment to strengthen their communities and foster Rwanda’s growth. The Gashora Girls Academy of Science and Technology (GGAST) is an innovative and socio-economically diverse model upper-secondary school designed to provide a “whole girl” education. GGAST provides a rigorous college prep academic program, combined with leadership training and extra-curricular activities that fills girls with confidence so they can pursue their dreams of university education and impactful vocations. Since opening GGAST’s doors in January 2011, Rwanda Girls Initiative has educated 270 girls each year with a 93 percent matriculation rate to universities in 16 countries, including 80 in the U.S. and Canada with $20 million in scholarships. Sahar provides access to education in Afghanistan and supports an educated future for Afghan girls, enabling them to actively participate in social, political and economic arenas in their communities. Sahar builds schools, computer centers and teacher training programs utilizing local labor and community support. Since 2009, Sahar has invested over $2 million in building, repairing and supplying schools in Afghanistan, a country in which 45 percent of schools operate without adequate buildings. Sahar operates 13 schools, 9 rural and 4 urban, and 87 classrooms have been built or renovated. Sahar impacts 18,000 girls annually and serves girls from Uzbek, Tajik, Pashto and Hazar ethnic groups. In total, Sahar’s programs have impacted more than 200,000 girls. The Rose International Fund for Children (TRIFC) is transforming education for blind students in Nepal. Being a blind or visually-impaired student in a developing country is an incredible challenge. 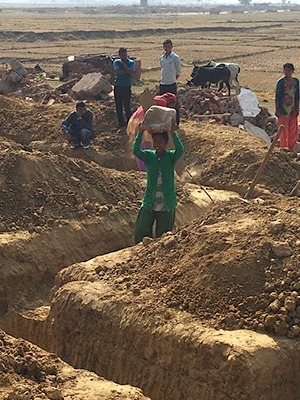 There are no areas of these student’s educational and personal needs that are properly covered with the limited funding provided by the Nepal government. Add to that the societal stigma attached to having a disability, where one is considered to be cursed or suffering from a past-life sin and the result is a neglected, marginalized group with a devastating loss of human potential. TRIFC is working to solve this problem through an innovative, holistic program which addresses all areas of need and provides students with the necessary tools to be successful in school and in life. TRIFC is working to enhance personal and educational support in the areas of health, hygiene, nutrition, school tools for the blind, daily-living skills and more. There is an education crisis, both in the United States and abroad. buildOn has been striving to solve this crises since Jim Ziolkowski founded the Connecticut-based nonprofit in 1991. The organization works to break the cycle of poverty, illiteracy and low expectations by engaging U.S. students in community service, and by building schools in the developing world. Randi Hedin, a buildOn board member and president of its Seattle Chapter, has been involved with the organization since 2000. “The organization’s mission around service and education is an important one for me personally and for my family,” Hedin explained. “Education is a critical issue nationally and globally, and the work of buildOn really resonates with me.” To date, buildOn has built nearly 1,000 schools in seven countries (Burkina Faso, Haiti, Malawi, Mali, Nepal, Nicaragua and Senegal). 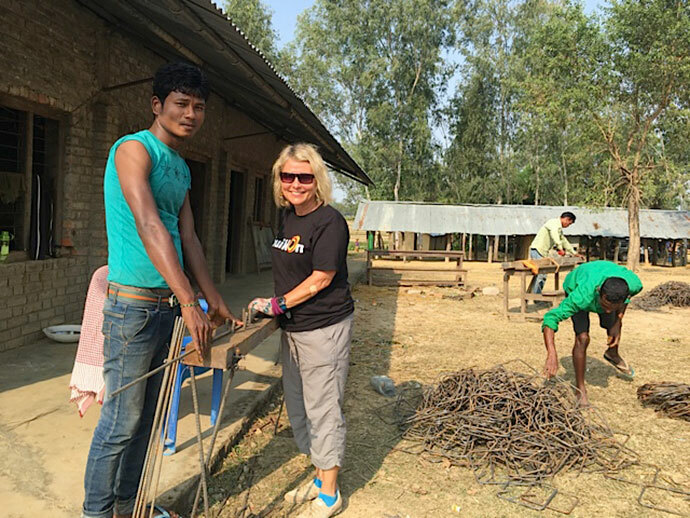 After assessing country need and local support, buildOn chooses a community for a school. “One of the measures that buildOn uses to choose a country is the Human Development Index (HDI), but you also need a stable country and buy-in from the government in order to be successful,” explained Hedin. The commitment by each partner is solidified with the signing of a buildOn covenant, which occurs before the groundbreaking of every school. This covenant, signed by a ministry representative, the entire community as well as buildOn staff and donors, is a promise by each partner to fulfill their role in building and maintaining the school. Communities are also required to establish a leadership committee with an equal number of men and women from the village who oversee the school’s construction and ensure the community is adhering to covenant requirements. Communities must send an equal number of girls and boys to each buildOn school and the organization monitors all of their schools for three years to ensure that the school is maintained and used for its intended purpose, and that it is educating girls as well as boys. To date, 49 percent of students attending buildOn schools are girls. “The signing of the covenant is amazing to see,” said Hedin. “To be there on the day of the groundbreaking and watch everyone sign, or leave their fingerprint if they are illiterate, is a very powerful experience.” To Hedin’s knowledge, no community has ever broken a covenant agreement. In fact, an audit conducted after the organization built its 500th school showed that only two schools were no longer being used, and both cases were due to the effects of natural disasters. buildOn is doing more than educating children. In 1998, the organization started an adult literacy program in five countries, and it will soon expand to a sixth. Evening classes are held at buildOn schools and provide adults with basic literacy and numeracy skills. According to Hedin, nearly 70 percent of the adults who participate in these classes are women. “It is incredible to see these women attending classes because they have very long days, and so much responsibility,” she said. To date, over 120,000 children, parents and grandparents are attending buildOn schools. The Seattle Chapter of buildOn is hosting a dinner on Thursday, December 1st, 2016 at the Seattle Marriott Redmond to raise money for building schools in Mali. For more information, contact Jacquelyn Horstmann, National Event Manager, at Jacquelyn.horstmann@buildon.org or 203-585-5391. For more information about the Seattle Chapter, contact Randi Hedin at randi.hedin@gmail.com or 425-233-7162. “A pilgrim is someone who knows where he or she is going. Someone who is headed somewhere. The destination makes the pilgrim.” Dorothy Echodu, CEO of Pilgrim Africa, an NGO with offices in Seattle and Uganda, uses this to explain her organization’s mission. Since Calvin Echodu, Dorothy’s husband, founded Pilgrim Africa in 2001 as a small, grassroots organization providing refugee assistance, it has evolved to focus on global education and malaria eradication. This evolution is a credit to Mr. and Dr. Echodu; they are pilgrims. In 1996, the Ugandan government moved citizens into government-run camps in order to protect them from the Lord’s Resistance Army (LRA). These camps were dangerous and rife with disease and those displaced were living in squalid conditions. It was close to impossible for NGOs to get into the camps because of the war between the LRA and the government. Calvin Echodu felt a call to help. “My vision for starting the organization was to restore hope and try to address the plight of displaced people,” Calvin said in regards to witnessing the conditions of nearly 1.7 million people living in poverty and disease. So he did what no one else could do at the time — he took resources to those living in the camps. “Getting resources to the camps took ignoring security and safety warnings, and driving through roads that were unsafe to travel,” said Calvin. Today, he continues to serve on the board of Pilgrim Africa, while also in the role of CEO of Earthwise Ferries Uganda Limited, a Ugandan based company that is helping to restore economic growth in East Africa by connecting cities through waterways. 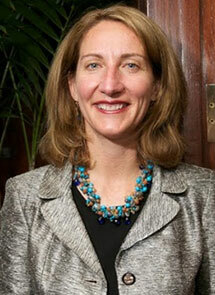 Dorothy also leads Pilgrim Africa’s malaria eradication work. In 2007, Uganda experienced severe flooding and Pilgrim Africa feared malaria would become a huge problem. “That was the beginning of our work in malaria and since then we have gotten incredible passionate about it,” she said. 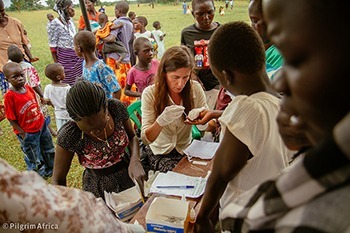 “We really feel malaria is holding the nation hostage and yet it is fully treatable and preventable.” In May 2016, Pilgrim Africa received a $2.49 million grant from the Bill and Melinda Gates Foundation to continue its innovative malaria eradication efforts. As part of the board, Calvin is working on developing Pilgrim Africa’s strategic plan and he hopes the organization he founded will to continue to evolve. They want to add innovative courses to Beacon of Hope School’s curriculum, such as robotics, computer science and welding to give students job-based skills, and want to eventually turn these courses into a Center of Innovation and Excellence to help respond to the emerging needs of the community. Pilgrim Africa’s leaders also dream of opening a university in Teso, Uganda, as well as starting secondary schools in places like South Sudan and Democratic Republic of the Congo, regions affected by conflict and war.